With the benefit of hindsight, we can see that the foundations of today’s ongoing digital revolution were laid in the 1980s, during what can perhaps be considered the first digital revolution. In that decade personal computers proliferated (primarily for business use, but increasingly in the home as well), the first mobile phone came to market (the Motorola DynaTac in 1983), and businesses made a fundamental shift from analog data storage to digital data storage. Telcos were, for a long time, at the heart of that early digital revolution, leading through their own early digital adoption and transformations, as well as enabling and driving the transformations of other industries as they expanded beyond voice communications and into data and broader ICT services. As early as 1984, BT was promoting itself, in the run up to its initial public offering (IPO), as “The Power Behind the Button”, with a clear emphasis on digital capabilities in its advertising. The digital focus helped to contribute to an IPO in which the shares were oversubscribed by more than three times. However, over the past decade or more, telcos have been increasingly left behind, both in their own right and as the enablers of their customers’ digital transformations. 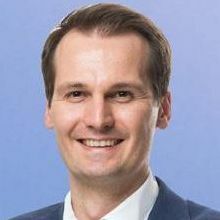 As we move into 2019 the situation is clearer than ever before: telcos need to rapidly up their digital games to avoid the ever-present threat of commoditization of their core connectivity offerings, in both consumer and business areas, The prize, or “Digital Dividend”, awaiting those telcos that can rapidly catch up with, or even overtake, their more digital competitors is significant, as this paper highlights. Our research, global senior executive survey and financial analysis have enabled us to quantify this Digital Dividend – we have calculated that a global pool of more than EUR 200 billion in operating free cash flow (opFCF) is available to telcos that become leaders in this space. The incentive for digital transformation is clear – and the need to embrace change has never been greater. Our analysis shows that while most, if not all, telcos have embarked on the digital transformation journey, the vast majority of global telcos are still at a relatively early stage of digital maturity. This paper presents the findings of our analyses and proposes means by which telcos can better understand their own digital maturity, as well as identifying and defining ways to improve maturity. We hope this will help those telcos that choose to act to enjoy their share of the Digital Dividend. Telco revenues have experienced low-single-digit growth since 2014. A very slight uplift in revenue growth is expected in the next five years. Despite some revenue growth, higher capex, combined with limited opex reduction, will put pressure on free cash flow. Digitalization is key to changing industry economics: broad adoption has the potential to yield a collective uplift of more than EUR 200bn opFCF. To complement this financial analysis, ADL conducted a global survey of more than 100 telco senior executives on digital transformation. 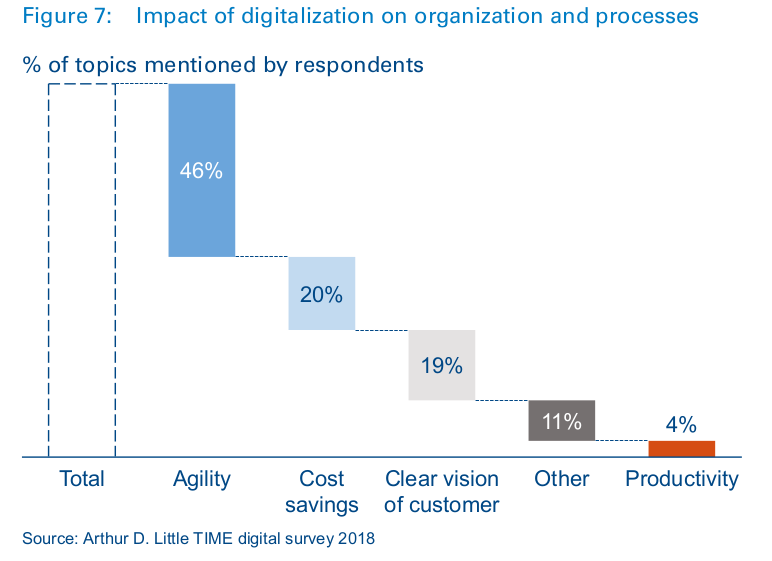 This survey confirms the importance of digital transformation for executives, in terms of both the potential opportunity, or “Digital Dividend’ and its resulting position at the top of CxOs’ agendas. Our analysis reveals low-single-digit global revenue growth from 2014 to 2017 (Figure 1). Overall industry growth was mainly driven by North America, while peaking wireless penetration in large, established markets, as well as ARPU erosion in other markets, put pressure on their respective growth. Operators have struggled to grow wireless revenues in major established markets due to saturation. 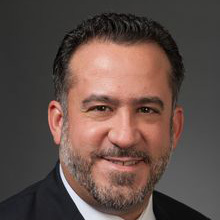 As the majority of the population in these markets already has a cellular connection, operators have found that incremental connections are no longer a reliable source of revenue growth. According to the GSMA, in North America wireless subscriber penetration has largely peaked and is expected to grow only 2 percent from 2017 to 2025. In North America, we observed wireless revenue CAGR of just 1.1 percent from 2014 to 2017. We observed similar trends in Eastern and Western Europe, which experienced wireless revenue CAGRs of 0.9 and 2.4 percent, respectively, from 2014 to 2017. As telecoms operators face increasing competition from other established operators, OTT players, and new entrants, fixed-revenue growth has also been limited; for example, Eastern and Western Europe experienced fixed-revenue CAGRs of 1.5 and 2.1 percent, respectively. Intense competition between operators has led to aggressive pricing behavior, and thus ARPU erosion. In Western and Eastern Europe, regulatory pressure has also had considerable impact on top-line figures. The rising number of OTT alternatives to traditional telecoms voice and pay-TV services has resulted in competitive pricing, which has caused further ARPU erosion, as well as subscriber loss. In our baseline forecast of global telecoms revenues, we show acceleration in revenue growth from 2017 to 2022, with an aggregate 3.0 percent CAGR globally. 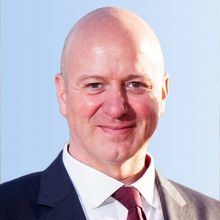 Although only slight, this uplift in revenue growth can be attributed primarily to increased high-speed wireless data coverage in emerging markets, higher revenue from fixed infrastructure required to support aggressive increases in data consumption, and new use cases enabled by 5G deployments in more mature telecoms markets. Indeed, new revenues from 5G are expected to arise from new B2B and B2B2X use cases, as significant incremental revenues are not immediately expected from consumer 5G services. Increasing wireless coverage and subscriber penetration will be a boom for telecoms revenues in regions with significant room for growth, such as Latin America and the Middle East and Africa (MEA). In those regions, we forecast total revenue CAGRs of 5.2 and 4.9 percent, respectively, from 2017 to 2022. Acceleration in revenue growth rates will not be limited to higher-growth regions, but will also take place in mature regions, where the latest wireless technology cycle is under way. In North America, for example, several operators are currently engaged in 5G technology build-outs. Sustained deployment over the next five years will give rise to new use cases and revenue streams, and subsequently drive revenue growth. In North America, we expect total revenue CAGR of 4.6 percent from 2017 to 2022. 5G deployment and fiber network expansion in mature telecoms markets, as well as continued LTE investments in emerging markets, will require major capital outlays. Our baseline forecast predicts global telecoms capex growing at a CAGR of 7 percent from 2017 to 2022 – a rate that is more than double the historical CAGR and also outpaces the forecast growth in global telecoms revenue for the same period, as seen in Figure 2. We expect capital investments to contribute significantly to the erosion of free cash flows for telecoms operators from 2017 to 2022. We project growth in telecoms opex to remain stable over the next five years, with no major supplier shocks or changes to expense structure. We expect global opex to increase at a CAGR of 2.7 percent from 2017 to 2022, which is roughly in line with the observed historical growth. 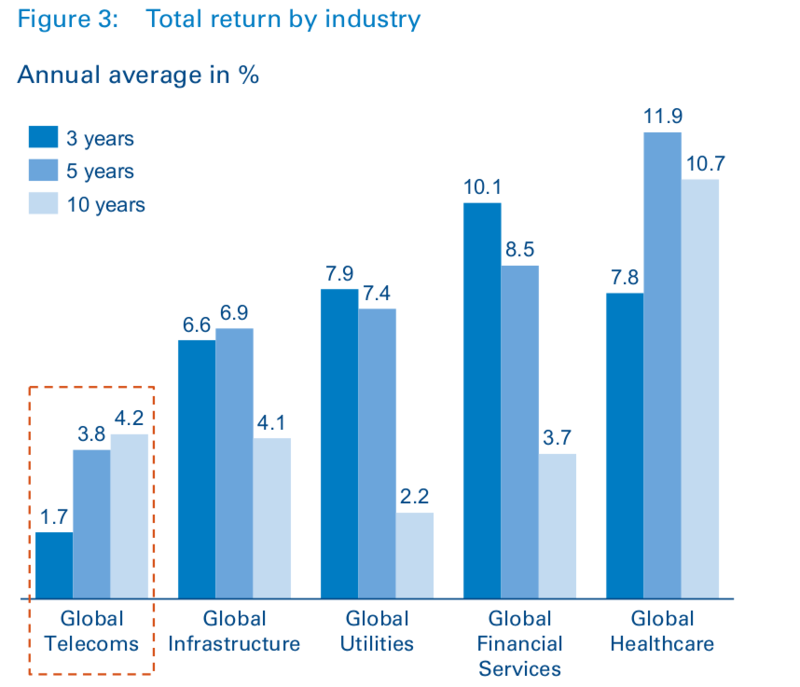 The financial performance of telecoms operators has already been weakening, resulting in significantly lower total returns of telecoms stocks versus other industries, as seen in Figure 3. Top performance of individual telecoms stocks is effectively driven by M&A. The expected pressure that capex and opex will place on free cash flow in the next five years will only continue this trend. We define digitalization as the application of digital technologies and interfaces, new ways of working to change an existing business model and create incremental revenue and other value-adding opportunities. Despite networks being the heart of the digital revolution, digitalization in the telecoms industry is seen as lagging or only on par with a number of other industries. 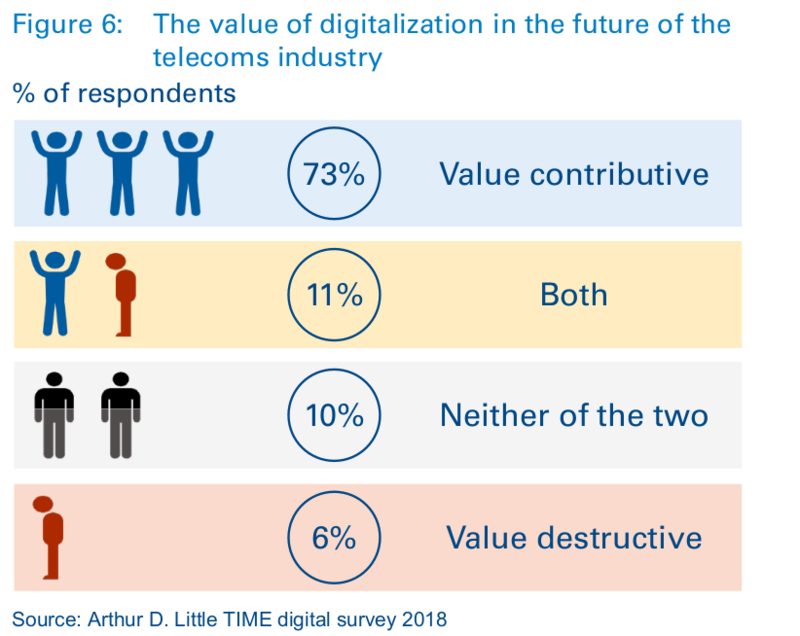 For instance, 65 and 55 percent of senior telco executives we interviewed considered the Financial Services and Retail industries, respectively, to be ahead of the telecoms industry in terms of digitalization. The digital gap between telecoms and other industries puts operator capabilities under pressure and demands increased focus on digital transformation. At the same time, telecoms operators must act on decreasing cash flows and weak share-price performance. Fortunately, digitalization of the telecoms industry can have a significant positive impact on operator financial performance, but operators have to act now to generate incremental cash flows from digitalization. Our digitalization forecast for the global telecoms industry projects accelerated revenue growth and reduced opex, with maintained capital investment, when compared to the base case forecast. The result is dramatic – broad adoption of digitalization has the potential to yield a collective uplift of more than EUR 200bn in opFCF for the 190 operators analyzed, compared to our “do nothing” base case, as seen in Figure 4. As well as making core business activities more efficient and reducing time to market for new products, digitalization can open up new revenue streams for telecoms operators. The result of the digitally enabled revenue acceleration and growth opportunities is a 1–2 percentage-point uplift in our revenue-growth forecast over the next five years. Telecoms operators also stand to realize opex savings across all facets of their businesses thanks to digital transformation, with opex CAGR over the next five years slowing to 1 percent from the base case projection of 2.7 percent. We recognize that digital transformation does not come without a cost, and that incremental capital investment is required. However, these investments do not significantly impact the total projected capex CAGR, which remains the same as for our baseline case, at approximately 7 percent. Through digitalization, the telecoms industry can buck the trend of weakened revenue growth and increased cost pressures to return to profit growth. We conducted a survey of more than 100 senior telecoms executives. We collected views on the telco digital transformation journey with broad global representation from major operators as well as smaller challengers (Figure 5). The survey results show clearly that digital transformation is at the top of CxOs’ agendas, in terms of both current and future focus. 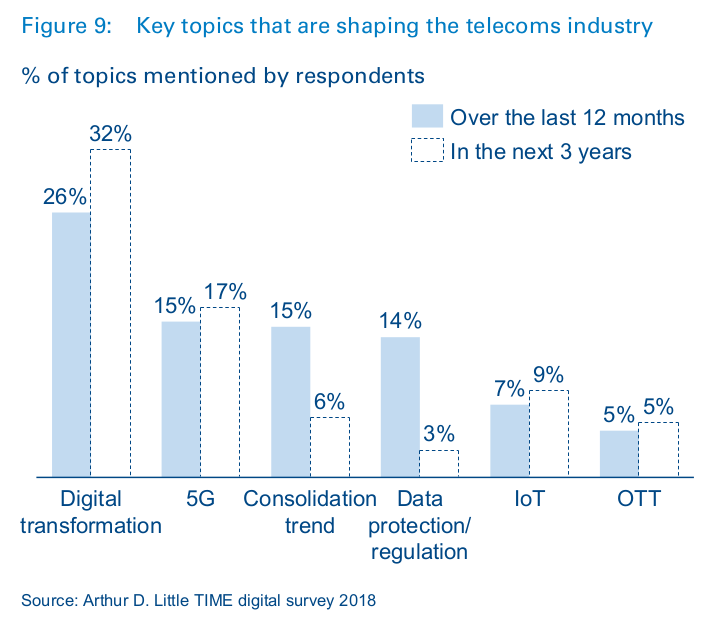 Aside from Digital Transformation, consolidation and new technologies, such as 5G and the IoT, are also expected to play an important role in shaping the telecoms industry in the coming years (Figure 9). Our financial analysis and survey highlight the scale of digital transformation’s impact on the telco industry. Despite the fact that most, if not all, telcos have already embarked on the digital transformation journey, the results also highlight that there is still plenty of work to do. Digital transformation is a fundamental requirement not just for success, but also for survival, as it changes the ways telcos operate internally and engage with their customers, and opens up new and incremental revenue streams. Our financial analysis quantifies the benefit of adopting digitalization; doing so could yield a EUR 200bn uplift in opFCF in the telecoms industry, given accelerated revenue growth and reduced opex with maintained capital investments compared to our baseline case. The imperative to fully engage and Embrace Digital transformation is clear. Objectively assessing and benchmarking the current state of digital maturity. Identifying the gaps and aspects of digital maturity in which improvements will have the highest impact. Defining a holistic approach to digital transformation, considering both technology and organizational/cultural changes that may be required. Driving rapid progress towards a fully digitally transformed organization, using an agile approach to deliver digital transformation across people, processes and systems. Each of these steps are considered in detail in the following chapters.